“Wise Child,” by Sharon Lee and Steve Miller was chosen from among fifteen stories collected in third annual Year’s Best Military and Adventure SF, edited by David Afsharirad, published by Baen Books. 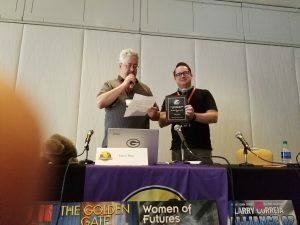 The winner was announced at the Baen Traveling Roadshow at DragonCon, with Baen Executive Editor Jim Minz accepting for Lee and Miller. The prize is a plaque and $500 cash. Below is the text of Lee and Miller’s acceptance speech. To DragonCon attendees, science fiction fans, and readers everywhere: Hello! from the wilds of Central Maine. We’re pleased to be here, at least metaphorically, at this particular Baen Traveling Roadshow, to stand as the proud parents of “Wise Child,” which readers have chosen – out of a very stiff field! — as the Best Military and Adventure SF of 2016. We must admit to being startled – we have a history of being startled when we win awards! – when Jim Minz asked if we could be with you this afternoon, either electronically or in spirit, to accept this award for our novelette, the seventy-first Sharon Lee and Steve Miller collaboration. We believe that the purpose of a story is to be an experience, a celebration, if you will, for readers – something that they’ll hopefully enjoy on reading, and recall, later, with pleasure. Us. . .We make our living by writing stories, long and short and in-between. Our method is to write the best story we can write, this time; collect our fee – and move on to write another story for readers to experience and enjoy, sometime down the road. Most short fiction is like that, for most writers: a kind of a fire-and-forget situation, if you will. In this case, though – we won’t forget that, when “Wise Child” hit the Baen.com website last year, we got a lot of positive feedback from readers via email and Facebook. Then, the story was chosen for inclusion in Volume Three of the Year’s Best Military and Adventure SF! This particular “fire-and-forget” story not only hit the original target but had two secondary hits, as well. Thank you, DragonCon, for hosting the award presentation! Thank you, Baen, for publishing and supporting the book, and the award! Thank you, David Afsharirad – our editor – for selecting our story for publication! Thank you, readers, for reading, and for voting, and for naming “Wise Child” as one of the best! Here you see Jim Minz accepting, and David Afsharirad showing off, the plaque. I enjoyed reading ‘Wild Child’ recently and, being new to the ‘Liaden Universe’, wondered where it fits in with the larger story? Thanks for a great read. I really loved Disian! Sigh. The story fits in … somewhere before our mentor went to work for Liz on Surebleak. Can’t get too much closer than that for spoiler reasons,. sorry.